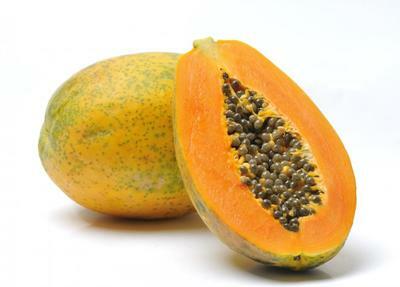 Papaya also popular as pawpaw is the fruit of the plant Carica papaya. Papaya is rich in nutrients and has various health benefits in digestion, weight loss, and medicines properties. Papayas contain soft, easily digestible flesh with a good amount of soluble dietary fiber that helps to have normal bowel movements. Inside, the fruit features numerous black peppercorn like seeds, encased in a mucin coat, at its hollow central cavity. The flesh is deliciously sweet, musky taste with rich flavor. Here on these page, we will see various important health benefits of papaya. It is just perfect for skin and so can be applied as face pack in order to reap its benefits. It helps in eliminating the skin problems like acne as well as other infections. The fruit can also be applied to heal the wounds not recovering quickly. It dissolves the dead skin cells and makes your skin look glowing and fresh. Papaya is rich in several nutrients like Vitamin C which can keep you free from stress. Papaya is an excellent food option for diabetics as it has a low-sugar content even though it is sweet to taste. Eating a papaya daily will prolong the process and may make you look 5 years younger than you are. Papaya is rich in Vitamin C, Vitamin E and antioxidants like beta-carotene which helps prevent your skin from free radical damage keeping wrinkles and other signs of ageing. Papayas contain soft, easily digestible flesh with a good amount of soluble dietary fiber that helps to have normal bowel movements; thereby reducing constipation problems. Eating papayas are good for your bones as they have anti-inflammatory properties along with Vitamin C which helps in keeping various forms of arthritis. Papaya is rich in Vitamin A which helps protect your vision from degenerating. As Papaya is rich in nutrients and a daily intake provides 200% of your daily requirement of Vitamin C, makes it good for your immunity. One of the great health benefits of papaya is it can lower your cholesterol. Papayas are enriched in vitamin C, antioxidants and fibre that help in the prevention of cholesterol formation in arteries. The risks for developing asthma are lower in people who consume a high amount of certain nutrients. One of these nutrients is beta-carotene, contained in foods like papaya, apricots, broccoli, cantaloupe, pumpkin and carrots. 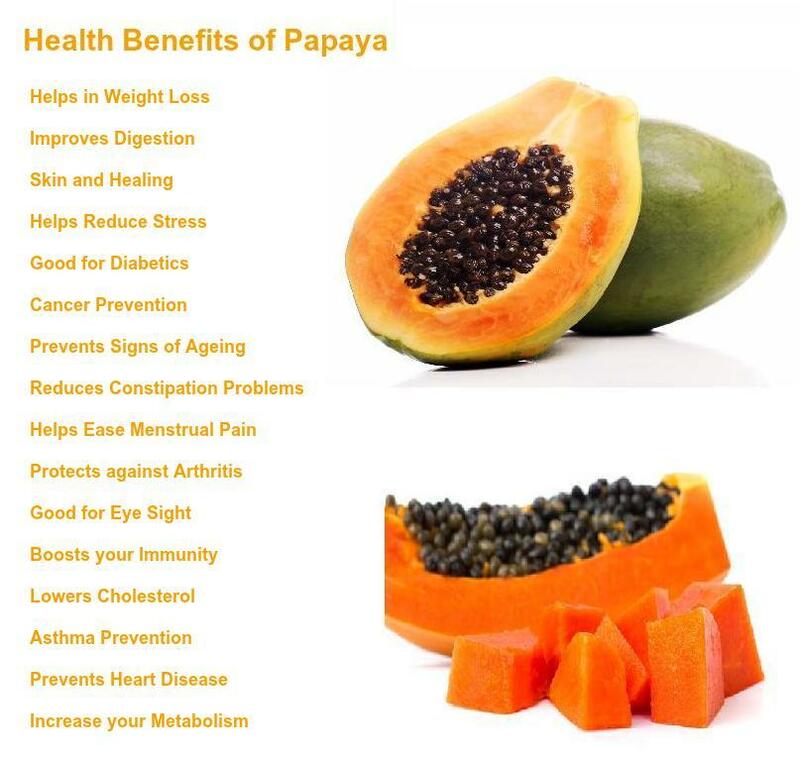 Health Benefits of Papaya fruit in increasing metabolism. The fruit is enriched with numerous important B-complex vitamins like thiamine, Folic acid, riboflavin and pyridoxine which play an essential role to increase your metabolism. There is no doubt in benefits of having papaya everyday but women are often advised not to eat it during their pregnancy because it is believed that papaya can cause miscarriage or even natural abortion. Ripe papaya is filled with nutrients, but should be eaten in little amounts. It is believed that unripe papaya is unsafe for pregnant women, but a fully ripe papaya causes no harm. However, all women are supposed to be very careful while consuming papaya during pregnancy. Why not to eat papaya during pregnancy? Unripe or even semi-ripen papaya has latex which may start uterine contractions. Papaya is usually advised to be eaten when women have irregular menstruation which means it is a powerful emmengogue. If uterine contracts then it encourages synthetic labor and this leads to miscarriage. Another reason to consider papaya as unsafe during pregnancy is it contains pepsin and papin content that can reduce growth and development of your foetus. In some cases, papain can wreck the possibility of the foetus’s survival. Researches have revealed that consuming papaya during pregnancy can cause anti-implantation, increased chances of post-implantation loss and embryo toxicity.